Want to bash better? 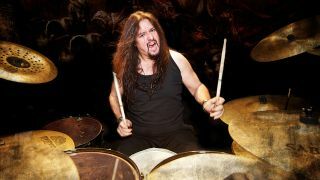 Gene Hoglan has a few ideas for you. Testament, Dark Angel, Death, Dethklok, Strapping Young Lad, Pitch Black Forecast, Fear Factory, Devin Townsend - drummer Gene Hoglan's resume is almost as impressive as his kick triplets (to say nothing of his uncanny ability to handle multiple tempo changes without so much as batting an eyelash). Hoglan broke down some of his famous turbo-charged beats and patterns on his 2010 Atomic Clock DVD, but as you might expect, the ambidextrous sticksman came up with a few new moves, all of which will be on display in an upcoming new edition. Not only that, but Hoglan will be soon embark on a series of drum clinics called The Gene Hoglan Experience, during which he'll tell stories from his incredible 30-year-career as well as demonstrating a thing or two on the skins. DO warm up and stretch before you play. Your body will love you for it in your later years by not breaking down on you. DON'T let anyone tell you what you're doing is wrong. You never know - you might be bringing something to the drumming table that has never been done before. DO absorb as many styles as you can. This will allow you to think outside the box when applying them to your style of music that you wish to play, and it will help you stand out from all the guys who only stick to one style. One-dimensional or multi-dimensional playing - it's your choice. I think the multi-dimensional players tend to stand out and go further in their careers. DON'T bog yourself down with too much lesson or drumbook study. Those are indeed great tools that are designed to help, but a great way to lose your individuality is by having teachers ingrain you with theirs. By all means, learn and absorb, especially the basics, but always remember that you are your own best teacher. For all of these years, this has worked for me. DO play with as many musicians as you can. Your learning curve will go up exponentially as you broaden your horizons by having many guitarists, bassists, singers or whatever in your life. A bunch of flavors in your playing life will turn you into something way tastier than the same ol' thing day in, day out. DON'T listen too much to high praise. Or the harshest criticism. Listening to too much of either can be quite detrimental to your psyche. If you know you're good, be the last to proclaim it. It's a lot more fun when others sing your praises for you. If you let your talents do the talking, they will speak volumes in your favor. DO pick up another instrument along the way. I suggest both guitar and bass, at least. To be able to converse with your band mates on their instruments is very beneficial, indeed. I've been playing guitar and bass - and singing, too - for almost 30 years, and it's come in extremely handy. DON'T get into playing your instrument for the wrong reasons. Getting girls and all is wonderful, but that's no reason to take up an instrument. You need to please yourself first, and playing the drums or guitar or anything else is so satisfying. But you should do it to enrich your soul, not to get the girls to like you. Also, partying too much too soon is a great way to burn yourself out early. I'm not saying that you shouldn't have fun, but a young player has too much to learn without throwing it all away on extracurricular activities that can become problems. A quick way to waylay your dreams is by getting clouded when you should be buckling down. DO learn how to read contracts. Legalese is way simpler to comprehend than you might think, and absorbing all you can about the business side of things will make a drastic difference in how your later years are spent. Contracts are knives aimed at your back - knowledge of how to read them is your armor and your protection. DON'T ever think you know it all. You're nowhere close. I know I'm not. I believe that a true musician never knows it all. Learning never stops.